Just back yesterday from family vacation at the beach in SC. This was the first week all year I hadn’t posted anything here, though I did check in on comments and couldn’t resist sharing a few links and photos on the Amish America Facebook page. I’m not home for long, taking off today on a week-long trip to Lancaster County. Lancaster in late September–fields emptying of corn, pumpkins and gourds everywhere, and a nip in the air as we roll into fall. I was last in Lancaster County in February which can mean extreme winter weather, though I got off pretty easily this year. I do enjoy coming in early autumn as the climate is usually excellent and the scenery arguably at its prettiest. I’ll be checking in with Abe’s produce operation, a market stand or two, and making plenty of other visits. On Thursday I’ll be attending the Forgiveness Conference at the Young Center at Elizabethtown College which I first mentioned here back in spring. I’ve gotten word that the day session will have quite a large group with well over 200 signed up to attend (now closed to registration), maybe I will see some Amish America folks there? There is also the evening session which is open to the public (no registration required) starting at 7:30 and running til 9pm. If you’re around I encourage you to come. It will be a nice capstone to the conference with 3 speakers scheduled, including Steven Nolt and Terri Roberts, mother of Charles Roberts, who shot the Amish schoolgirls five years ago this October 2nd. Speaking of Terri, one of the most moving pieces I’ve seen on the school shooting was her interview in the back of the paperback edition of Amish Grace. Find a short excerpt of that interview here. I can only imagine what it might be like for her to speak about her experience in front of a large group which will no doubt include a significant Amish contingent. The Conference will underscore the most important act of that infamous day, the choice by the Nickel Mines families to forgive their children’s killer. I don’t think it’s a message that we can hear too many times. If you do make it out to either session I hope you’ll at least flag me down to say hello! For more info: Young Center Forgiveness Conference. Congrats ladies, and to claim your copy, email me at amishamerica (at) gmail.com with the address where you’d like your issue sent. If you’d like to subscribe to the Connection, you can find out how here. Secondly, this isn’t the last you’ll hear about the Connection–stay tuned for an interview with the founders upcoming on the blog. Occasionally you see some odd looking horse-drawn contraptions parked in front of Amish homes. 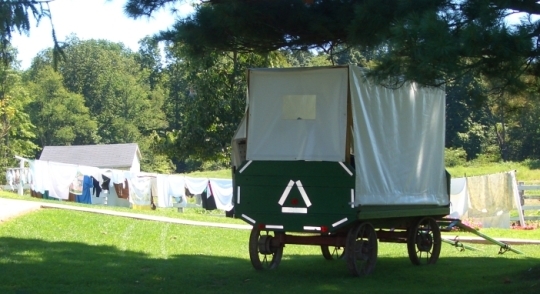 For one example, see here (6th photo down; not an Amish vehicle in this case, but a tourism-use wagon being worked on by the Amish tarp shop owner). Here’s another shot of an odd wagon in Ashland County, Ohio. What is this thing? It looks like an Amish-style concession buggy. Just thinking competely outside the box…. I think it’s a wagon that used to sell produce, baked goods, etc. at some place like a farmer’s market, by the roadside, etc. … I was going to guess a produce wagon for setting up as a portable road side produce stand. I could see some baked good and maybe some bottles of honey stuck in here and there. It sure isn’t a photo booth, LOL My guess is it’s a book mobile! All areas need a moving book library. Just returned from a refreshing 10 days in Lancaster County. The day I got there was the day of the flooding and over 100 roads were closed. What was supposed to be a 4 1/2 hour flight took 11 hours because of flights backed up to land in Philly. Then next flight was delayed, delayed, canceled…finally got off, had missed my next connection, waited on the next flight…you get the picture. What topped everything off, when I got to Lancaster Airport, ready to pick up my car from an off-site car rental, who was supposed to meet me, (and their office (in Akron) was only about 6-10 miles away), they refused to come, leaving me stranded. A very nice man I had talked to before (who works at the airport) was kind enough to leave his job and take me to Avis (an off-site location) to pick up a car. I said all that to say yes, everything was wonderful after that first day! Though they had some hot days, I think the weather was cooling some and fall is definitely in the air. There are still fields of corn, although I did see some being worked. Large, beautiful pumpkins lying in the fields. Apple cider for sale. Once place I wanted to go to was the Bent& Dent store mentioned here, I think the name of it is BBs. All I can say is if I lived there, I would shop there first then get the remainder of my groceries elsewhere. It’s a full grocery store, with a neat walk-in cooler at the back, very cold with all kinds of things there. There’s a neat gift store sitting beside it; it’s well worth the trip there to Quarryville. I left there and drove to Georgetown where a resturant has a “Amish Wedding Meal” on friday nights. It was great! Someone had mentioned Lantz Discount Groceries, I went there, they are a small grocery store. As soon as you walk in, turn right and check out their walk-in refrigerator with it’s old wooden door that shuts behind you. They make their cheese (I believe)–I brought home some spicy cheese for my son. My favorite thing that I did was, I took the “Witness” tour to the farm–loved it. It was pricey, but something I’ve long wanted to do. Home now, safe and sound–I know you will have a great time, Erik. There’s just something about being there in the fall. It’s just one more idea (wish) for what I can do when/if I ever retire! I am thinking about something concerning my friends and other Amish people that I would like to tell you about privately. Do you have an email address or some other way for me to contact you? see you at the conference, Erik. I’ll look for you. I would say a vegetable & fruit wagon to sell their products….. Thanks Erik, glad I was a winner and looking forward to receiving my copy of THE CONNECTION MAGAZINE…..